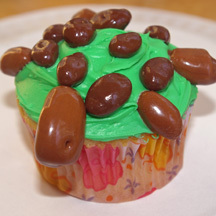 This happy green turtle cupcake is topped with tasty Tootsie Rolls and chocolate-covered raisins. Wearing plastic gloves, you can mold Tootsie Rolls, caramels, Starbursts, Airheads and other candies into all kinds of fun shapes. This design is similar to one I saw in a Betty Crocker publication. What You Need: 1 cupcake; frosting tinted green; chocolate-covered raisins such as Raisinets; Tootsie Rolls (any size); toothpick. How to Make It: Frost cupcake green. Add 6 to 10 Raisinets to top for turtle shell “spots.” Wearing gloves, shape chunks of Tootsie roll into four legs, a tail and a head. Use toothpick to draw eyes and a mouth. Add to cupcake. This entry was posted on Tuesday, July 19th, 2011 at 2:38 pm	and is filed under animal cupcakes. You can follow any responses to this entry through the RSS 2.0 feed. Responses are currently closed, but you can trackback from your own site.